Der Artikel Sinne Eeg (geb. 1977): Face The Music wurde in den Warenkorb gelegt. 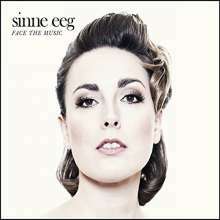 Whenever Denmark’s leading jazz vocalist, Sinne Eeg records, she always has a handful of new original songs with her. Sinne Eeg doesn’t write „compositions“ – she writes catchy songs that could easily find their way into the more commercial branches of the music business. Listen to The Best I Ever Had, which is a truly wonderful song. Natives of Copenhagen not only have the privilege of sharing their city with one of Europe’s finest jazz singers, but also one of its brightest songwriting talents. „Face The Music“ features songs with finely facetted themes, arranged and performed to perfection by Sinne Eeg and her favorite trio, pianist Jacob Christoffersen, bassist Morten Ramsbøll and drummer Morten Lund. The CD also contains a few carefully selected standards, including the first track – a swinging cha-cha-cha version of What a Little Moonlight Can Do, and a perfect match for Sinne Eeg’s voice.